I love finding unique items for Baby Digger’s room. When designing and putting her room together we did alot of DIY and craft projects to make her room very personal and special. Now that she is a toddler she tends to get scared if she wakes up in the middle of the night and its dark. So, I set off to find a nightlight that would help her to feel more comfortable overnight and hopefully fall asleep easier and more soundly. In my search I came across the most adorable store with whimsical and unique night lights, White Rabbit England. White Rabbit England is the brain child of sisters Charlotte and Victoria.. The sisters set out to find a modern replacement for the light they had known and loved as children. When they couldn’t find anything suitable, they resolved to make their own. But not just for themselves; for children all over Britain too. And so White Rabbit England was born. I fell in love with all the magical and whimsical yet modern nightlights and just had to have one for her room! I chose the pink Dewdrop Toadstool Nightlight in pink for her room because the colors would accent so nicely and I love the adorable handpainted scenes on it. Her night light arrived in a simple white chic gift box. I was so excited I opened immediately and pulled out the night light and oh my goodness it is even more adorable in person! I placed it in Baby Digger’s room out of her reach on her storage unit and turned it on for her that same night. It looks like it was made for her room! I like that it has a switch so you can leave it plugged in and easily turn it on and off with the flip of the switch. The light it gives off is just as whimsical as the nightlight itself. Soft light comes out of the top of the toadstool holes and the little window and reflects onto the walls and ceilings just enough to give off a reassuring light so she can fall asleep easier and not get scared in the dark overnight. Shes had it in her room for the past few nights and I’m happy to report that it does seem to be helping her feel a bit more comforable at night. I’m in love with her nightlight and can see it being passed down through the years because it is heirloom quality and little girls are sure to treasure it. The White Rabbit England Dewdrop toadstoool nightlight is available to purchase at www.whiterabbitengland.com. They have many other wonderful nightlights with cushions to match as well as bedding, china and jewelry. 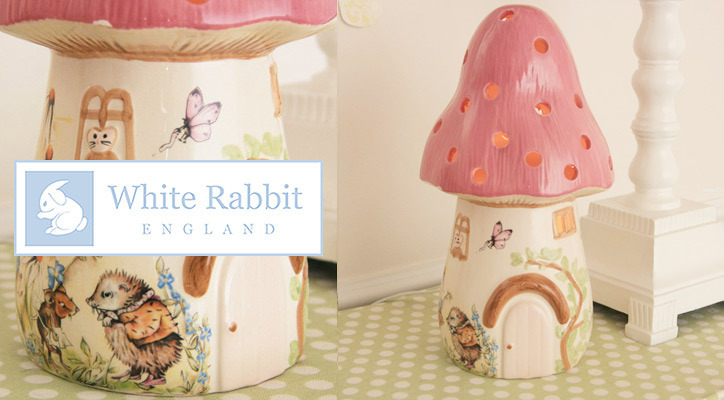 The White Rabbit England is giving one lucky reader a Dewdrop toadstool nightlight RV $85! To enter fill out the Rafflecopter form below. Ends 3/18 at 11:59PM EST. I received a White Rabbit England Dewdrop Toadstool nightlight for the purpose of this honest review. All thoughts and opinions are my own. This post was written by me and not edited by anyone. the owl night lamp is gorgeous! our daughter room is being decorated with tinkerbell and owls. I would love to win this for my first granddaughter due to arrive in June. I love all the mushroom shaped lights! Love the pink heart throw and the cushion!